Does anyone know why Messages would be using 23% of my battery over the last 24hours? I mean, I text, but I wouldn't say excessively. Also, I've turned off location services for Messages. Any way to see HOW a specific app is using battery? Thanks! Re: Messages using 23% of battery? Which iOS version are you running on your iPhone 8? Had you used messages a lot during that 24 hour period in relation to other apps? Just because it says 23% doesn't necessarily mean it's a battery hog. 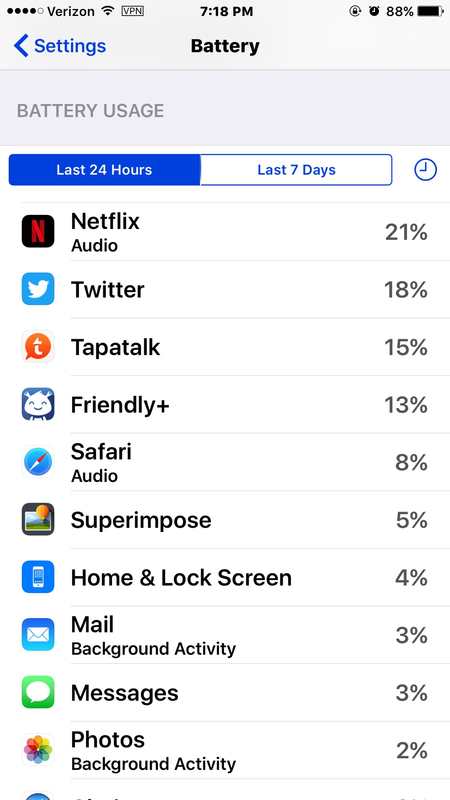 It Mostly tells you which apps you used most. Notice Netflix is 21%. Yet it's hardly a battery hog. I have simply used it a lot. TapaTalk is more a battery hog. Thanks! I had to readjust my thinking. I thought it was using 23% of the battery, but it really means that of the apps that used battery, it used 23% of the battery based on the apps that used battery. Subtle difference.